MUSSO & Frank wins for longevity. When in doubt, order a martini. This much-mentioned beverage is a classic for many reasons, one of which being the simplicity of the ingredients. Gin or vodka, vermouth, ice. Not much room for error. 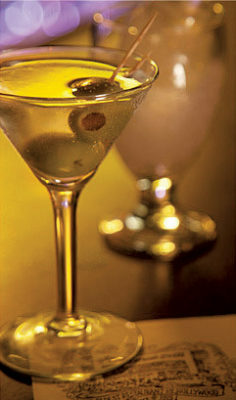 It is surprising, however, that the quality of martinis varies considerably by bar. And, just as the classic drinks are often the best, our research (and difficult research it is) shows that the classic restaurants tend to serve the best martinis. As of yet (our studies into this will continue, do not fear), we have not been able to pinpoint exact reasons for this, and it may be that the atmosphere of the old-school venues adds to the essence of the drink. Is it the number of shakes (provided you are going for a Bond “shaken, not stirred” style), the amount of ice used (solely to keep it cold, not to remain in the drink), the exact ratio of vodka or gin to vermouth, and/or olive versus twist? The mind staggers at the possibilities of what should be an easy equation to deduce. We have, however, been able to narrow down the options to a few of our favorite establishments to savor these tasty creatures. For one of the longest established (pre-dating the Hollywood sign) and most famous of the list, we offer Musso & Frank, which has been serving celebrities, and the rest of us, prized martinis (extra on the side) for years. Another favorite, Taylor’s Steakhouse, which opened in 1953, remains a staple in the now-Koreatown area. We love sitting at the bar for dinner, and Taylor’s martinis, regardless of the bartender, are always the perfect level of dry for our tastes. Pacific Dining Car, established in 1921, and serving food 24 hours, can also provide an excellent martini, until 2 a.m. at least. Very few luxury trains remain, but at least someone can experience the parlor car ambiance in this historic setting. Completing our short list of our favorite martini-sipping spots is the HMS Bounty, established in the early 1960s. The nautical theme may scream rum, but the menu is better suited for a martini. For those who insist on the Winston Churchill favorite, the gin martini, stirred lest one bruise the gin (so we hear), we have yet to begin research on that. We actually may continue our craft cocktail quest first.